I feel kinda bad about this one as I had asked Nicola over at Wots for Lunch for a post 2 weeks ago and have only just gotten around to it. @ weeks ago my world collapsed a little as my work computer crashed hours before deadline and the Friday after that I was frolicking with goats at Fairview. Lady Raven has been asking me if I would like to do a guest post for her for awhile and every time she has extended the invitation I've chickened out. But this week when she asked I couldn't say no and so a mad scrambled began as I tried to figure out what to post about. Luckily I found something in my archives that thought might be fun to revisit, home-made pickled ginger. Making it yourself is so easy and the flavour is much fresher and not as sweet as the commercially produced kind. Peel the ginger and thinly slice using a mandoline or vegetable peeler. Sprinkle slices with salt and leave in a bowl for an hour or so. Drain the slices of ginger and pat dry to remove any excess salt. Gently heat the vinegar and sugar together until the sugar is dissolved. Pour the vinegar and sugar solution over the sliced ginger and leave to cool. Once cooled store in an airtight container in the fridge until needed. You don't have to limit yourself to eating pickled ginger as an accompaniment to sushi either. 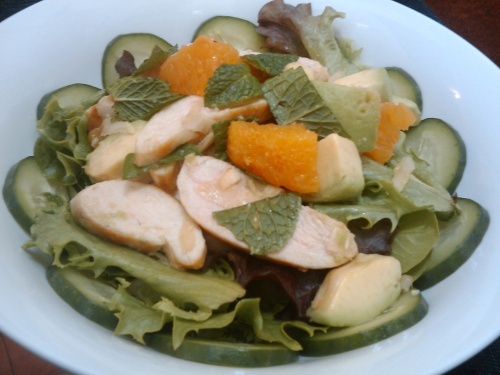 Here I've used it in a salad (you can't really see it, but it is there) with some sliced chicken breast, avocado, orange, cucumber and mint. It's a really refreshing meal for those warmer days that are heading our way. Love love love pickled ginger! Can't believe it's so easy to make at home. I normally just eat it as is, but will definitely try it as per your salad suggestion. I will be trying this! 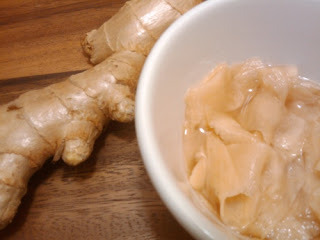 Love about anything flavored with ginger. I'm new here and so glad to find your blog. I'll be looking around at all the recipes, thanks! @LadyRaven - Thank you so much for your lovely comments, it's so great to receive such positive feedback about my blog. @Marissa & Pam - it's a great staple to have waiting in your fridge.